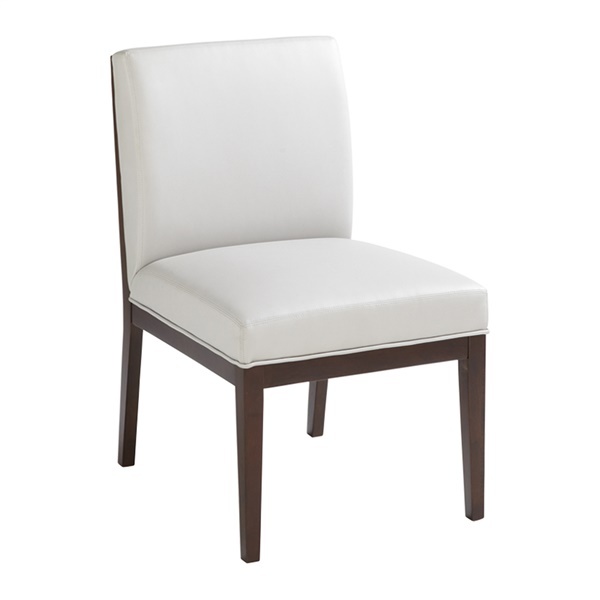 Sleek and stylish, the Othello Dining Chair is a perfect blend of both classic sensibilities and bold contemporary style. Its simple design makes it a perfect addition to any number of dining tables. What�s more, it�s a comfy spot to enjoy family dinners. The Othello�s frame is crafted from solid wood for premium durability and sturdiness. Metal wear-resistant stretchers provide reinforced stability, while a built-in footrest adds support. The legs are finished in a matte black for an added touch of sophistication. Generous back and seat cushioning make this chair supremely comfortable, while bonded leather upholstery adds a soft, smooth and luxurious look and feel.